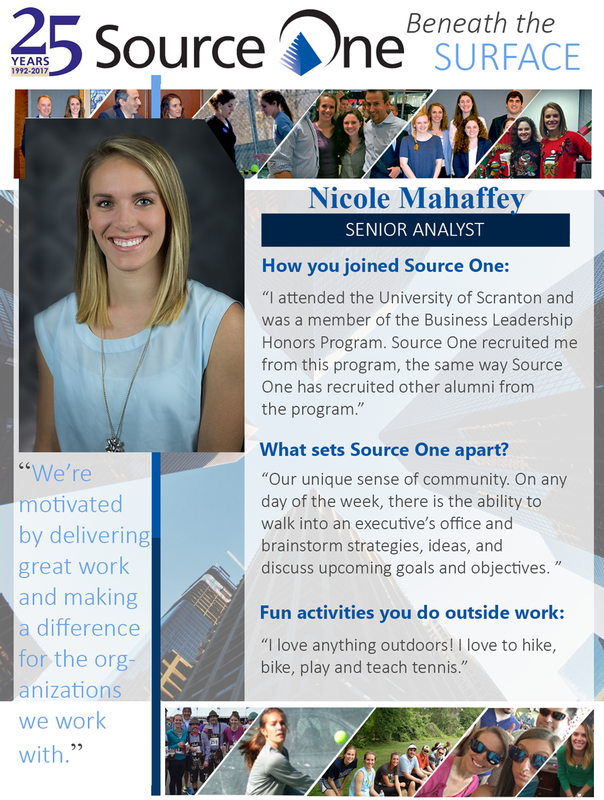 Home Featured Source One News Beneath the Surface: Meet Source One Senior Analyst, Nicole! Beneath the Surface: Meet Source One Senior Analyst, Nicole! As we continue celebrating our 25th Anniversary, we're highlighting some of the incredible talent that makes Source One's procurement team great. This week, we'd like to introduce you to one of our Senior Analysts, Nicole Mahaffey. Nicole is a versatile strategic sourcing analyst, helping companies reduce costs and optimize budgets in Marketing, MRO, and Facilities. For early young professionals looking for a rewarding career, Nicole highly recommends Procurement. "It's a great opportunity to get exposure to a wide range of business units, like Marketing and Supply Chain, as you're helping these teams gain a better sense of what they're truly looking for in their supplier or vendor relationships," Nicole shares. "While there's always something new to learn with each project you take on, the skills you gain from analyzing spend and working with stakeholders and suppliers are transferable across industries and categories." Learn more about Nicole and her experience at Source One in her Beneath the Surface Series Spotlight below!